WSU Shore Stewards is an educational program offered by WSU Extension in Jefferson, Clallam, Island, Kitsap, Mason, Skagit, Snohomish and Whatcom counties. The program is designed for those living on waterfront or stream-side properties who want more information about good stewardship practices for their properties. By understanding and applying a few habitat-friendly concepts they are creating healthier waters and shores for birds, fish and wildlife. Homeowners, renters and residents who live along the shoreline, in communities with shared access to the beach, or who have a river or stream on their property are invited to join. Farmers and forest owners, parks, port districts, cities, businesses and others with land along shores and streams are also invited to participate. The program focuses on 10 habitat-friendly guidelines. Shore Stewards voluntarily apply as many as of these 10 guidelines as they can when caring for their beaches, bluffs, gardens and homes. When you sign up, you will receive newsletters and emails letting you know about shoreline and stream-related educational program in your community. Shore Stewards understand that as owners and users, we are the stewards of these beautiful resources. We are learning all we can so we may care for them wisely and pass them along to the next generation in even better condition. 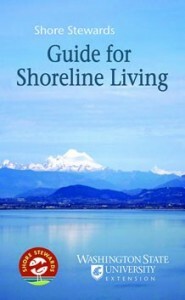 To view or download the new, updated Guide for Shoreline Living, CLICK HERE (3MB). CLICK HERE to visit the new Shore Stewards Website to check out the 10 Guidelines for Shoreline Living and fill out a shore steward application. New in 2015!! Shore Stewards TV!! CLICK HERE to check out all our videos on the Shore Stewards TV playlist on YouTube or select one from the list below and enjoy. For more information, contact Cheryl Lowe, cheryl.lowe@wsu.edu, 360-379-5610 x 230.